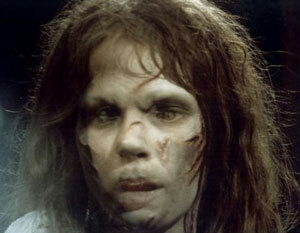 I didn't see The Exorcist until I was 22, and it scared the living crap out of me. All the Freddies and the Jasons, the Hammer Horror an Medusa Pictures, Poltergeists, Evil Deads and People Under The Stairs couldn't prepare me for the full on terrifying malevolence of that movie. I'm still not entirely sure what does it: the claustrophobic mix of innocence and evil? The grotesque special effects? That bloody music that still sends a shiver down my spine? Suffice it to say, The Exorcist is the only movie to ever really give me nightmares (okay, aside from ID), including one so vivid that for several seconds after waking I was convinced that Regan was kneeling by the head of my bed, watching me sleep. So I approach The Last Exorcism, a low budget horror flick which, by dint of having Eli Roth's name slapped all over it, has made it into the multiplexes, pleasingly prepared to be scared. But would it deliver? The Reverend Cotton Marcus (Patrick Fabian) is an evangelical showman, a crowd-pleasing preacher who's been performing since he was ten years old. His star turn is, of course, the exorcism, which he sees as his way of helping troubled people ease their minds by casting out demons in which he himself has no belief. For a hefty fee, of course. But his conscience has finally got the better of him, and he's jacking in preaching after one last gig, an exorcism in Louisiana, to which he has invited a film crew to capture all the tricks of his trade and expose the ceremony for the charade he knows it to be. Like his near-namesake, the Reverend Cotton Mather, the man responsible for the deaths of so many innocent women during the Salem witch trials, Marcus has absolute belief that he is right. Boy, does he have a lot to learn. The 'found footage' idea is getting pretty tired now, but director Daniel Stamm uses it well as a means of introducing our dubious hero then capturing his journey into the heart of darkness. (Although why insist on blowing camcorder ruse by adding creepy music? Believe me, heavy breathing and the crunching of bones are equally effective…) The documentary format successfully serves to blur the boundaries between reality and fiction, just as Cotton struggles to distinguish ugly human failings from supernatural evil, mental dissolution with demonic possession. If you through the trailer look a bit same-old-same-old, don't be fooled – it may not be as scary as The Exorcist, but this is still a cracking little horror movie. And if you're a fan of Hammer, you're gonna love the denouement. Marks out of ten? 6.66, of course.